We have been rushing through another build that I am unable to discuss or show anything on. But I was able to find some time to wrap up the Dive sign I started awhile back. It feels good to strike that off the list. 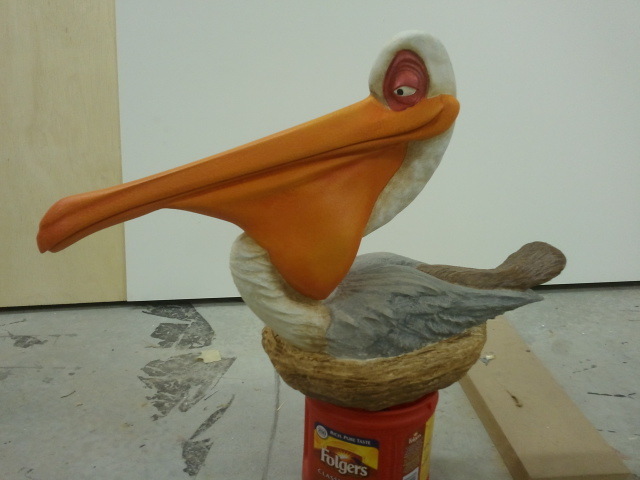 The Pelican's Landing sign is almost finished as well. Whenever I got a moment, I would mix some paint and apply it, set it off to dry, and then get back to the 'real' job we have going on. This job gets delivered on Friday, and then we start the flying machine build. The 'model' is built in the computer and has undergone some minor changes due to script enhancements. I have been finding time here and there to get the concept model laid out in real world dimensions, and usable files for Aspire. I am thinking that I may make a styrofoam engine block, or maybe not, I am a little indecisive on this part! Hopefully Monday will see our Techno cnc chewing out frames and wing components. Until then, at least the dive sign is done! A while ago I posted about some miniatures we had made for a television commercial. Well I finally saw the ad on television, and found it on U-tube. I think the spot looks pretty good. Both the director, and art director did a killer job. This week so far has been relatively easy going for us. 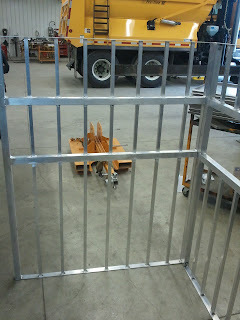 We delivered our 2 walled shark cage on Tuesday afternoon. This came out great! 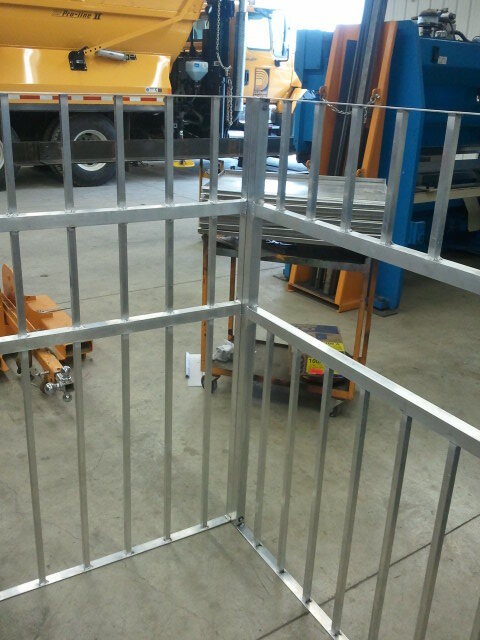 Being that the cage would actually be submerged for most of the shoot day, we opted for using the aluminum. If this was a "dry" shoot, we could have used any number of materials at our disposal, but aluminum it was. I don't weld aluminum, at all. So when push comes to shove, I take it to the pros at B M Welding & Fabrication in Port Perry. These guys have done some other jobs for us, and they really understand the deadlines involved with our line of work. Plus their work is outstanding! 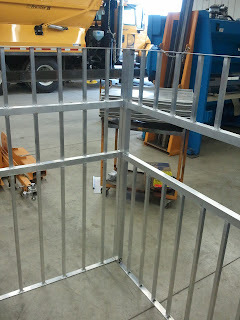 Being that only a portion of our shark cage will be in frame, we only needed to make it 5 feet tall. It's a little distracting with all the other stuff in the photos, but you certainly get the idea! On the Saturday past, I was able to attend the Vectric software's Ontario User Group meeting in Guelph. This was hosted by a stellar fellow by the name of John Murphy. He actually had it at his shop, and was a gracious host, right down to supplying the food. I got a chance to speak about some of the processes involved in the work we do at Oxenham Design, as well as listen to another speaker, Gerry Perrault, from Quebec. Gerry does a lot of styrofoam sculptures, and is a true professional through and through. We got to trade some secrets about foam coating and fabrication. Gerry would be a handy guy to have as a work neighbor! I also got to meet a bunch of other really great guys, who use the same Aspire software we do, and produce exceptional work. It was really great to put faces to the names. I want to get the 2 sample signs wrapped up this week. I have been working on that pretty diligently. The pelican for the Marina sign is now done, and the sign body has it's primer coat on. 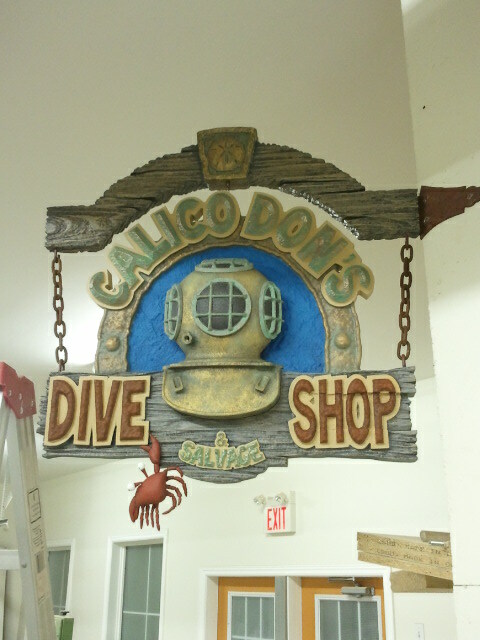 The top bracket for the Dive Shop sign got finished and primed today as well. Woo hoo! I also got the little crab that is going to hang from this sign built as well. He was pretty fast. His body is a small pies of HDU, and his legs and stuff are epoxy putty. I used an armature inside all the pieces so I could glue them into recesses in the body. This crab ain't going nowhere! He will look quite good when he's all painted and placed in jeopardy! 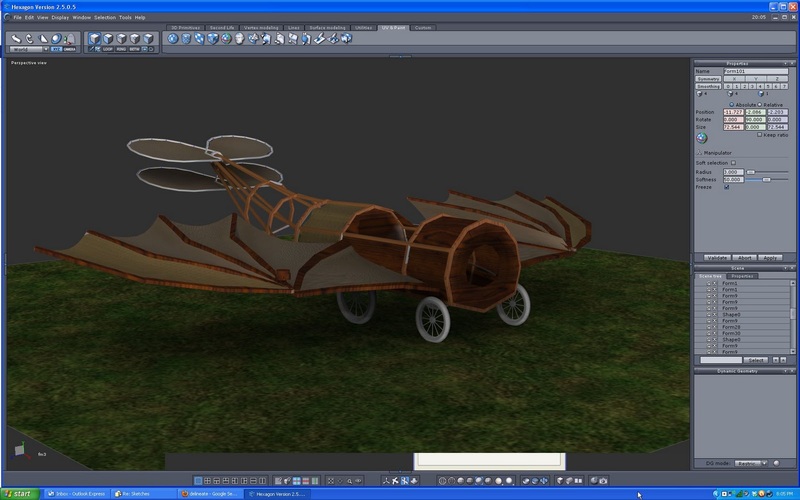 Hopefully these will all be done by the weekend, as we have to start our full size flying machine very soon. This, I believe, shoots on the 23rd of November, so we should get a go ahead fairly soon. They approved the design renders already. The nice thing about being the art director of your own designs, is sometimes the design can evolve while your building, and you get to make the changes without stepping on any toes!